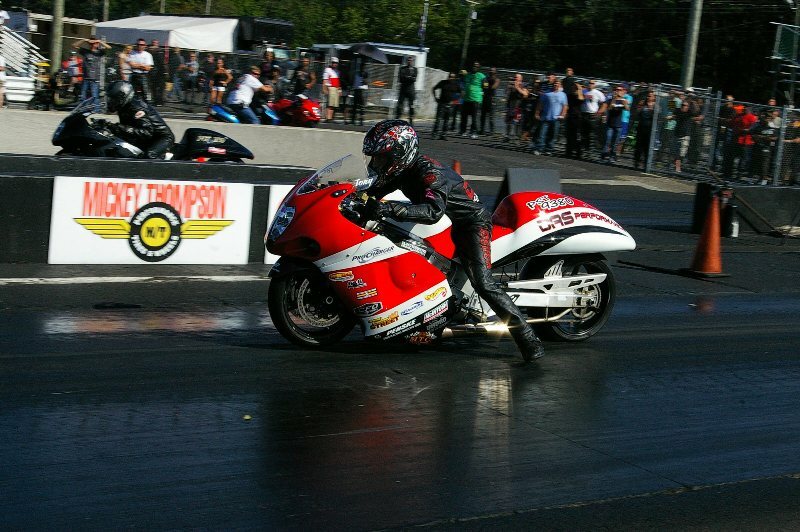 At 4:10 PM during qualifying at the MIROCK, Orient Express, US Nationals, Massachusetts racer Tony Ficher, driving the DAS Performance, Pro Street Hyabusa stunned the crowd with a 6.908 elapsed time at 209.95 mph. The team DAS bike, now sits not only in the number one qualifier spot, but is firmly perched on the first step of a new National Record for the class. On the Launch – Tony Ficher of Falmouth, Mass launches his team to the first half of what could be a new record in Pro Street. The official record in Pro Street for MIROCK belongs to Rodney Williford of Rogemont, NC. Rodney stopped the clocks with a 6.913 in September, of 2012 and backed the number up. The unofficial G.O.A.T. listing of the greatest runs of all time in Pro Street reveal Ficher’s 6.098 is the second quickest pass ever by a P/St bike. The quickest ever number was run by Ryan Schnitz in October of 2011, during eliminations of a MIROCK race. Ryan stopped the clocks with a 6.907, a mere thousandth of a second quicker than Ficher. Eric Paquette, of Dracut, Mass, is the team owner and builder of the DAS Performance machine. The 1397cc Pro Charger, super charged Suzuki Hyabusa feeds on a diet of VP C-16 and generally runs on close to 32 pounds of boost. Team DAS needs to back the 6.908 run up within 1% to establish a new National Record with the MIROCK sanction. Time Slip – The numbers tell the tale, Tony Ficher is currently the second quickest Pro Street bike in the history of the class. If he can back this pass up within 1% team DAS will own a new world record in Pro Street.